If you’re reading this, congratulations. You did it. You made it through September. It was touch and go for a while there. I don’t mean to sound dramatic but it really felt like September was going to break me at times. I don’t know exactly why, to be honest. Something about the shift in the season, the impending months of rain and gloom, the back-to-school chaos and feelings and schedule enforcement, not to mention the emergency preparedness forms that always seem to send me into a spiral of anxiety and sadness. Note to future Hillary: structure the expiry of Poppy’s EpiPens better next year so you don’t have fill out emergency contacts for Grady’s school the same week you visit Poppy’s allergist for a new prescription. The what-ifs were not kind to me in September. And now it’s the second week of October. Grady is settled into his new classroom. We’re rocking the morning get-out-the-door scramble. The days are getting shorter and there’s a chill in the air but it’s less terrible than it was a month ago. It’s no longer shocking to head out the door in the morning and realize it’s jacket season. It just is. It’s time for flannel and cinnamon and closed-toe shoes. If you need me, I’ll be over here soothing myself with pumpkin pie and preparing to hibernate until next summer. We live in BC, which means for a significant part of the year we’re travelling to and from school, sports, and activities in the dark. Or at the very least, in the rain – the seemingly non-stop grey and gloom of our beloved temperate rainforest. As we say goodbye to summer and welcome the rain clouds with a resigned sigh, we need to ensure our kids are visible, especially when conditions are less than ideal. If I could, I would send my kids out into the world wearing head-to-toe fluorescent and light-up helmets. But what my kids wear isn’t 100% my decision anymore. They have their own opinions and want to make their own style choices. They are fashion while I am all about function. Zapped Outfitters is a Canadian company inspired by our dark winters. Founded by Scarlet Kux-Kardos, Zapped Outfitters makes covert reflective gear for elementary school-aged kids that’s waterproof, resilient, and visible at night. Their custom-designed fabric is embedded with glass beads, making each item fully reflective, without looking like safety gear. In fact, the reflective print on Zapped gear works the same way that high-visibility reflective tape works, and in a very similar manner to the paint used on street signs and road markers. You can send your kids out into the world feeling cool in their stylish, urban active-wear and breathe easy knowing they’re actually decked out in gear with retroreflection properties. Excuse me while I adjust my science hat. Retroreflection occurs when a significant amount of reflected light is returned directly to the original light source, e.g. a car’s headlights. When headlights hit Zapped’s reflective material, the millions of microscopic glass beads that make up the Zapped custom print refract the light and the silver paint underneath becomes light reflecting. Your child becomes very visible to the driver of the car is what I’m saying. Zapped provides all the essentials: kid’s shoes with reflective material for safety, reflective backpacks, fully reflective rain jackets, and cool kids’ ball caps. Each item is designed with an edgy style for rugged active play with impressive abrasion resistance, breaking strength, and water repellency so kids can play hard and be seen. We received the Zapped reflective backpack and ball cap to review. At first glance, their charcoal exteriors with black and yellow accents give an edgy vibe. According to Grady, the Zapped logo is “so cool,” but I know he hasn’t seen anything yet. We turn off the lights and snap a picture with my camera’s flash turned on. The back pack and hat light up, the print fully illuminated. It’s magical. It blows Grady’s mind. “That’s SO AWESOME,” he yells. When Shawn gets home from work Grady asks me to show him the magic light trick. I feel like Fun Mom (a feeling I’m not used to) and try not to blurt out the safety features and reveal my secret: this is cool gear, it is fun gear, but it is also safe gear. I fail, of course, but Grady doesn’t care. He’s too busy taking pictures with my phone to listen to my explanation of reflectors and the speed of light. Zapped Outfitters’s tagline is: Play Hard / Be Seen. To celebrate their launch, they’ve partnered with backpackbuddies.ca, which helps fill children’s backpacks with food items for the weekend when other food programs are unavailable, and rubensshoes.com, which donates shoes to kids in developing countries who might otherwise miss school due to a lack of footware. A portion of proceeds from shoe and backpack sales will be donated to both organizations to help all kids play hard and been seen for the incredible tiny humans they are. Use code HILLARY20 to receive 20% off your purchase on zappedoutfitters.com. Not valid on in-store purchases. Grady's first day of school is tomorrow and weeks ago I figured I wouldn't want to spend the last weekend of summer break meal prepping so I ordered HelloFresh. I am very fond of weeks' ago Hillary. She didn't know it then but this week is absolutely bonkers for Shawn with work stuff and band stuff and two days in San Diego. I'm pretty stoked to not have to worry about food this week is what I'm saying. Monday: We barbecued burgers and ate a suboptimal watermelon in a desperate attempt to pretend it's still summer. Tuesday: Cajun-spiced Chicken Burgers with DIY Dill and Parsley Mayo from HelloFresh. In our experience, whenever the HelloFresh delivery has a bread product in it, it's best to eat that meal first. Wednesday: Turkey Burrito Bowl with Avocado Pico de Gallo and Cilantro-lime Rice from HelloFresh. Thursday: Delivery pizza for the love of lowered expectations. I will throw a vegetable in the children's general direction. Friday: Fusilli al Forno with Beef, Homemade Marinara, and Fresh Ricotta from HelloFresh. 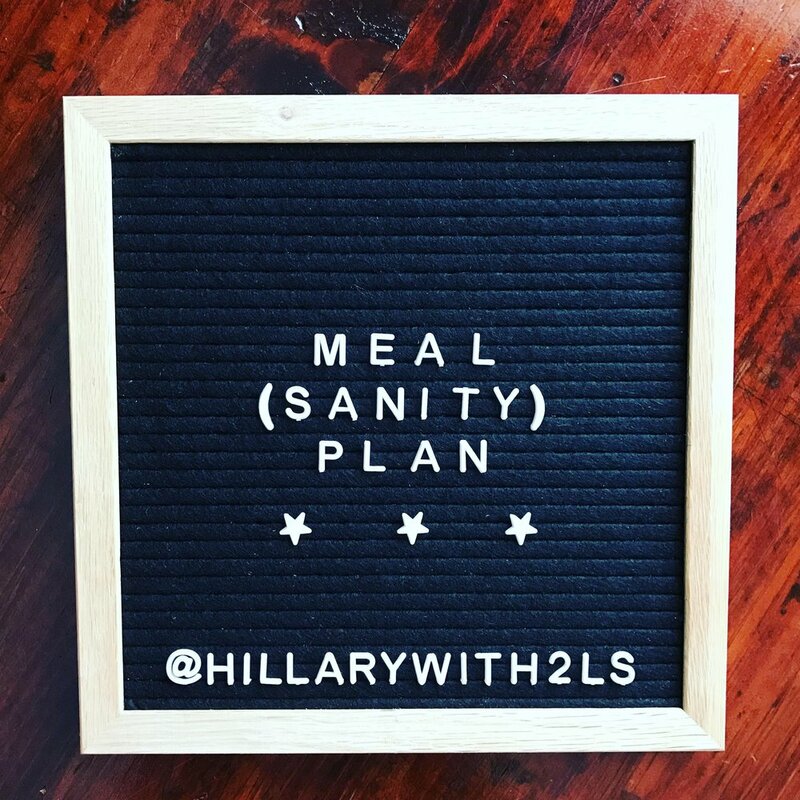 If you want to jump aboard the "we have to feed these people multiple times a day every damn day SOS" train, you can get $40 off your first box using this link (and I'll get $25 off my next box and love you forever).